Solvated electrons are highly reductive so can force stubborn compounds to react where other reagents might fail. 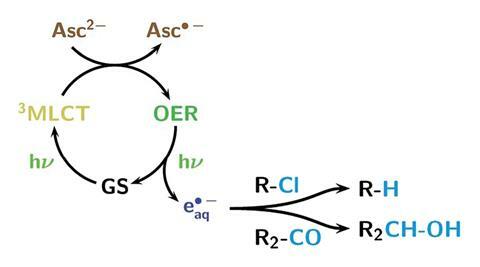 Now a team in Germany is generating them sustainably, using only a green laser and vitamin C. The group has used the technique to perform reactions previously impossible with a visible-light responsive catalyst. Photons from the laser transform a ruthenium-based photocatalyst into an excited state, with a central oxidised ruthenium atom and a radical anion ligand. Vitamin C’s ascorbate dianion then quenches the excited species, producing a one-electron reduced form of the complex – where the ruthenium atom is no longer oxidised, but the ligand remains as a radical anion. Another photon can then eject the additional electron – generating the hydrated electron species that can induce reduction reactions of organic compounds, and simultaneously returns the catalyst to its ground state.